I don’t work on Tuesday, or Wednesday. It’s my ‘weekend’, as uncharacteristic as that seems. And I like to spend some of that time in the kitchen, creating and preparing and filling the refrigerator. I’ll bake a loaf of bread, make muffins sometimes, a few simple creations that can be lunch for Mike and I. Wednesdays are the one day each week that I can count of some solo time at home, too. Both Mike and Griffin have church activities that evening, so for a few hours I can have a quiet house, time to catch up on Hulu or rock out to the 70’s station on iTunes radio, if I want. Sometimes the cats will sit and look at me with their golden soulful eyes, and we will just sit together, all piled on a chair, with a stack of magazines in reach, a cup of steaming tea. The roasted cauliflower and raw shaved fennel seemed like an odd combination. While I could devour an entire head of cauliflower, burnished from a blazing oven, I’ve found that I’m not overly fond of roasted fennel, preferring instead to the subtle bite of it raw, especially shaved ultra-thin, so thin that sunlight seems to stream right through it. And this dish, well, it was one of those meals that I make just for me. While I don’t doubt that Mike would eat it, perhaps even enjoy it, there is an entirely different mindset that comes when I am feeding just myself over making a meal for all of us to enjoy. I know I would eat so differently if I lived alone, and I can count on my Wednesdays to offer up just enough time for ‘Me’ food; quick, simple meals that no one else in our home would touch. A lot of them lately have had Brussels Sprouts in them, both roasted and shredded. Many of them include eggs. Wednesday food. My food. A plate of cheese, olives, crackers and nuts, beside a tall glass of wine is perfect Wednesday food. So is a pan of roasted vegetables and a handful of cooked farro. It doesn’t have to be much of anything but sustenance. Sometimes, it doesn’t even have to be that. I’ll have toast for dinner because it’s all I crave. Or popcorn. I’ve had grapefruit for dinner, seared in a cast-iron skillet until it nearly melted, then topped with a handful of chopped nuts. It was perfect Me food. Some of my most favorite recipes started out as Me food. But back to that cauliflower that was cooked, with fennel that was not. The impetus for this dish was brought about by a recipe I saw that, while it looked like it might be delicious, it was almost unbearably white, with raw cauliflower and fennel, and Great Northern beans. We’re in the last gasp of a very white early Spring, and the last thing I want is a plate of deathly white food that fades in to the background of our endlessly white landscape. I would eat the dish, but not like that in its paleness. It needed a rich, deep color against all that white. With one bite I knew my instincts were right about this combination, especially with the dark contrast of the beluga lentils. I shouldn’t have doubted myself. Made-up recipes can be like that though; we aim for greatness and sometimes it goes through the uprights, like whoever figured out that mashed avocado on toast was delicious, or it veers off just a bit too far and we get Gummi Worm Bratwurst (bleah…). Cooking from the hip, without a recipe for guidance, scares a lot of people. We like our outcomes to be predictable. We like to know what’s going to end up on our plates. Recipes give us that assurance, and when followed to a ‘T’, an expected outcome is anticipated. When I post photos like this to my Instagram feed, inevitably I will get a response that asks for a recipe. Then I’m backed up against a wall because I rarely follow recipes and I have to give some sort of explanation as to how I got here. Sometimes, all I want to say is “Trust your gut.” Because we know what we like, and we have some sense of what goes well together, and if it doesn’t, then we learn and move on. You may not like fennel. You maybe don’t eat lentils. Maybe you’re not even on Instagram. Maybe you already know what your own personal Wednesday food is, and you eat it all the time. For me, I’m adding this to my list of ‘Me’ foods, and wishing that I’d dreamt it up sooner so I could have enjoyed it all Winter long. Heat oven to 400°. Place cauliflower on a baking sheet and drizzle with olive oil. Dust with kosher salt and a few grinds of black pepper. Mix with your hands to combine, then place sheet in oven and roast, stirring occasionally, until browned and tender, maybe 25-30 minutes. Allow to cool slightly. 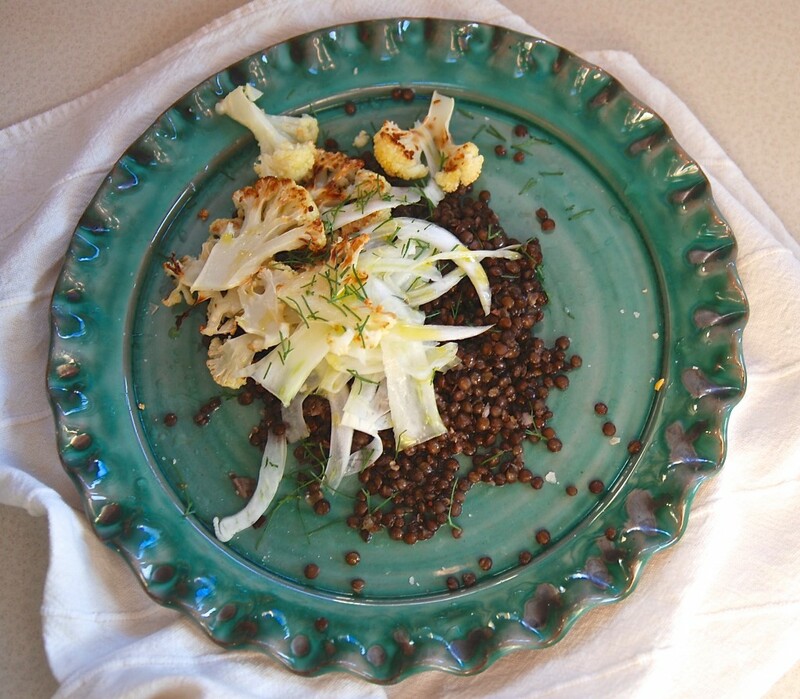 Place cauliflower, and shaved fennel in a large bowl. Grate some fresh lime zest on it (lemon would be awesome too) and squeeze half of the lime in with the vegetables. Drizzle with olive oil and toss carefully. Taste, and add salt and pepper if needed. Place some of the cooked lentils on a plate and top with the vegetables. Sprinkle on the reserved fennel frond, if you wish. NOTE: I like to cook my lentils with plenty of crushed garlic and a sliced shallot or two. Add a few bay leaves, or herb stems like parsley or thyme as well, if you have them. The small black or green lentils hold their shape best for salads. I cook 1-2 cups at a time, which usually double in volume, leaving you plenty for another recipe. 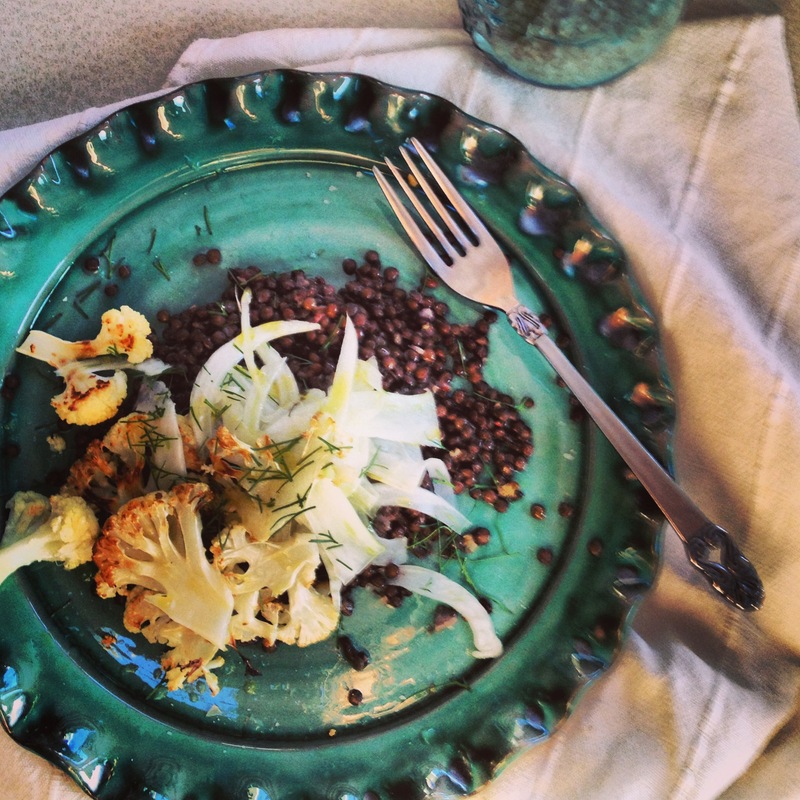 This salad looks insane – it has all my favorite things, lentils, fennel and cauliflower!! Yum! This is such a beautifully written post. Thanks! This must have been a great salad!